Sons of Hodir Commendation Badge can be purchased from Magistrix Vesara in Dalaran for 16 JP. Without the JP guild perk, Cata heroic bosses drop 70 JP, and of course, there are several of those bosses in each instance. On top of this, For Great Justice will increase your JP gains by 7 per boss, which is half of a commendation badge right there. She sells rep badges for the other main Wrath factions as well; getting Exalted with all of them should take less than a day. 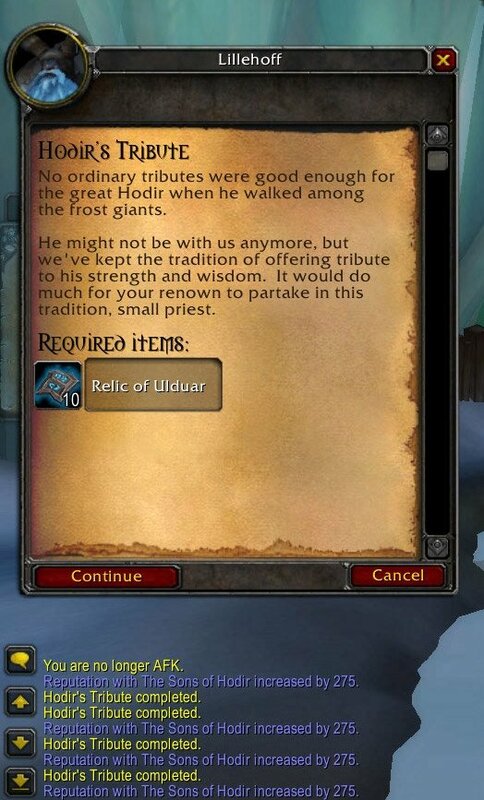 If you're short a tiny bit of reputation before hitting Exalted, or you just don't feel like running any more dungeons, Relic of Ulduar is usually on the Auction House in limited quantities, but isn't cost-effective. If you're level 85 and you haven't done the Halls of Lightning quests yet, I highly recommend doing them to build rep. When I started working on the Sons of Hodir, I was already halfway through revered just from completing the quests in the Storm Peaks. I'm not sure how many times I did the dailies to get there, but I don't think it was more than three times. Yesterday, I had 14000 of the 21000 rep to be exalted. I did all of the dailies once first, then I ran Halls of Lightning, did the quests associated with it and turned in the Relic of Ulduar I had gotten (which ended up being over 150) and got the 7000 rep I needed. The nice thing about running HoL is that the relics dropped frequently, and the mobs who dropped them always had more than one. I'd say about 60% dropped and they usually had 3 or 4 (with some exceptions, obviously). Its easy now if you have some justice points lying around, just complete the quest chain starting with They Took Our Men! and after completing it just go to dalaran and visit one of your old justice point vendors they sell badges that give 520 rep for 16 justice points. By just doing the required quests that opens up Sons of Hodir as a friendly faction (Mending Fences and A Spark of Hope), I hit revered, with the guild perk as my only rep boost. (he's in the dalaran sewers!, next to exit pipe) and he gives you Luxurious Getaway! If you didn't bother to read any of the guides and just thought that you'd get neutral by finishing sibling rivalry then here's a heads up. In addition to that you also have to do The Refiner's Fire in order to get to neutral/honored. After I finished that quest chain I went up to honored. He also sells several mounts: Reins of the Ice Mammoth\/Reins of the Ice Mammoth at Revered for and the three-seater mount Reins of the Grand Ice Mammoth\/Reins of the Grand Ice Mammoth at Exalted for . These grant the achievements Ice Mammoth and Grand Ice Mammoth respectively.